The times are indeed rough for the people of Enugwu-Ukwu community in Njikoka Local Government Area of Anambra State, as rampaging erosion has sacked more than 500 of them from their homes. By the disclosures of the elders of the area, the erosion has taken over 70.5 hectares of their communal land. The natural disaster, which washed away many farmlands, economic trees, and public utilities sited in the affected land mass, also affected 100 homes. The residents of Urunnebo village, Enugwu-Ukwu disclosed this on Tuesday when officials of the Nigeria Erosion and Watershed Management Project (NEWMAP) visited the sites to ascertain the level of damage done by the erosion. They explained that erosion-induced flooding of their area started over 30 years ago and as­sumed the current terrible state because no serious action had been taken by past and present leaders in the state and at the federal level. Their spokesperson, Mr Nwadinigwe Emmanuel, said that many of the villagers become tenants because their homes were destroyed by the erosion. He said that they made efforts to control the erosion at the initial stage through planting of bamboo and Melina trees, but they could not stop it. While pledging that remedial work would start in the area soon, the Anambra State Project Coordinator of NEWMAP, Michael Ivenso and Sola Akinsikun, the Director of Communication, Aries Concept Nigeria Ltd, which partnered with NEWMAP to check the menace, urged the residents to embrace positive environmental practices to ensure that further damage is not done to the ecosystem. A month ago, residents of Ihuaku in Ebenato Okpala community, Amichi in Nnewi South Local Government Area of Anambra State were sacked by flood and erosion, which destroyed their economic trees, farm lands, as well as killed their domestic animals. The Chairman of the Ihuaku Kindreds, Mr Chinedu Muonago, said the community had spent millions of naira to check the erosion menace without success. He regretted that whatever materials used to wage the flood were always swept away by the uncontrollable heavy flooding that gather from the adjoining communities, including Igbo-Ukwu, Isuofia and other parts of Aguata Local Government Area. The Secretary of the Community’s Town Union, Chief Michael Obiekezie, said the ecological problems in the area could only be solved if the flood from neighbourhoods was properly channelled. 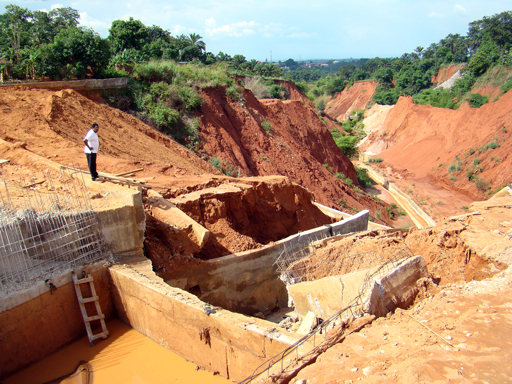 Meanwhile, the Anambra State Government has identified 950 active erosion sites in the state. Governor Willie Obiano who raised the alarm over the growing threat of gully erosion in the state, said that with over 950 gully erosion sites existing within a land mass of 4,844 square kilometres, it was clear that unless something drastic was done, Anambra could be washed away by erosion. The governor called on the Federal Government to declare Anambra an ecologically-endangered state and expedite response action. The World Bank, through NEWMAP recently approved the commencement of work on the erosion sites in Ugamuma-Obosi, Ikenga-Ogidi, Enugwu-Ukwu and Abidi-Umoji. Already the state government has concluded plans to plant one million trees in the state as part of efforts to curb the gully erosion. The Managing Director of Awka Capital Territory Development Authority, Mr. Michael Okonkwo, who is also the chairman of the steering committee of the tree planting exercise, said his panel had visited Lagos State to understudy its Greenery Programme aimed at developing parks and gardens in strategic areas.